Opulent towns, grand resorts, culture, night life, picturesque villages, great beaches, the best food, peaceful islands, national parks Kvarner is a huge and beautiful bay separating Istria (the north Adriatic) from Dalmatia (the south Adriatic). The principal city of the region is Rijeka, an important commercial centre with excellent shopping and cultural life, modern art museum, its own theatre and opera and a rocking night life. Rijeka has a newly refurbished town beach with good sea swimming and several swimming pools, beach bars and restaurants. 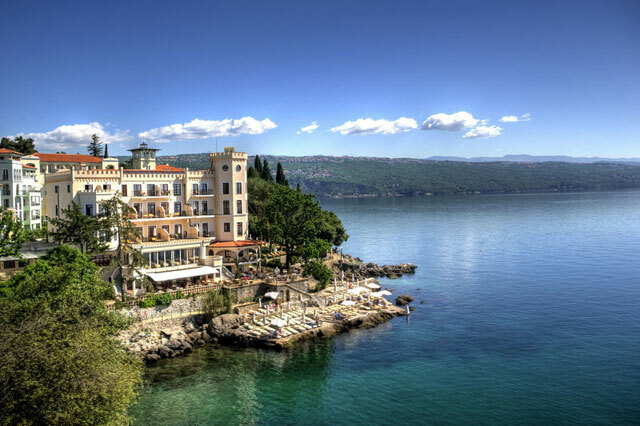 To the west of Rijeka are the sumptuous resorts of Opatija and Lovran which have a different feel to the Venetian towns on the west coast of Istria. Due to their mild and healthy climate these resorts were established by the Austro Hungarian elite in the 19th century and their style and character is defined by the palm studded parks, fountains, original art deco hotels and grand villas built for the Austrian aristocracy. This area has many of the finest restaurants in Croatia, many wellness centres, some fantastic bars and clubs and a 12 km long coastal path. Kvarner music scene and night life is very lively. You get summer open air opera, theatre and dance, and also many parties. The best party place is Rijeka.The resorts and nearby villages all have excellent beaches and swimming areas with views across the Kvarner bay to the Island of Cres. Cres itself, which can be easily reached by car ferry from Brestova, is a magical place. If you take a speed boat, you can be there in 15 minutes and swim in pristine waters. South from Rijeka are a number of attractive coastal resorts, notably Crikvenica and Novi Vinodolski. Crikvenica has several excellent beaches right in the town centre, a “Blue Flag” beach which has ramps for people with walking difficulties. The beach offers various water sports: water skiing, para-sailing, pedal boats, beach volleyball, table tennis, animation in the sea, and rental equipment. The beach has plenty of cafe bars, restaurants, sports and children’s playgrounds, there is a water slide. Further south is the resort of Novi Vinodolski, a seafaring town with excellent pebbly and sandy beaches, superb seaside cafes and restaurants. This was the first Croatian resort with a designated public and private beach in 1878. (Beach Lisanj). There are excellent beach sections for children and a great walking path along the sea. A few miles uphill are some charming villages with splendid sea views and great holiday homes - visit Briibir and Grizane. The backdrop to Crivenica is the highest mountain in Croatia - Velebit, a place where you can still find wolves and bears. This beautiful national park provides rugged walking and climbing with mountain huts and wonderful views over the Adriatic. Above Rijeka and Opatija is another National park - Ucka mountain full of cycling and biking nature trails and wonderful viewing spots. Off the mainland, there are some amazing islands which belong to the Kvarner region. The Island of Cres is known for its olive groves, and the Island of Losinj boasts a very sophisticated town of Mali Losinj which was the resort of emperors in the past. The Island of Rab is maybe the undiscovered beauty of the northern isles of Kvarner bay. Do make a trip to the small island of Unije, which is simply beautiful and totally understated, with a couple of beachside restaurants. You can also include the island of Susak, which has huge but empty sandy beaches. There is a ferry from Rijeka.